Achieving more with less is a core goal of most businesses. In the warehousing and industrial world, that means building more, shipping more, doing more – controlling more – with fewer resources. The typical issue is labor in many of these operations. It takes people to run a shipping operation, and plenty of them. Whether you are engaged in order fulfillment, assembly, manufacturing, distribution, or any other form of Internal Logistics, this is the reality. When this current economic downturn ends, as they all do, will you want to gear up with as many people as you had before it started? Employers must find ways to accomplish the tasks they need to without increasing personnel. That’s the core mission of material handling – it helps you do more with less. If you were accustomed to shipping 200 orders a day before, and now have to ship only 100, and you’ve reduced your headcount from 50 to 20, will you really want to enlarge it as business flows again? Quite likely, that answer is no. But how do you go about it? Typically, every touch, or transaction in an operation (as one of our clients called it) costs money. An order enters your system, and someone has to read it, and perhaps key it into a system. Then, someone else has to pick that order and send it to shipping. From there it must be checked, packed, and sent. There can be twice as many touches as this. Or more. Each time the order is touched, the cost of that order increases, and the profitability of fulfilling it falls. Each time, there’s a chance for mistakes, which doubles down on the number of touches in the process if it results in a return. Keeping, and retaining the touch that adds value is the key, while shedding or improving those that don’t. For instance, a quality control touch could be eliminated, but might cost you more in the long run as returns increase and customer satisfaction falls. 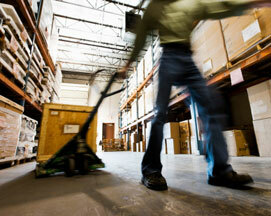 How do you reduce worker injuries? How do you reduce worker fatigue? How do you improve worker productivity? How do you assist in reducing wasted cubic space? How do you reduce the number of times a product is staged as it travels the manufacturing or distribution process? Can you automate or partially automate any of your processes? Can you implement a solution that allows you to accomplish what you do, at future volumes, with current personnel? Can your improvements produce an acceptable ROI, in particular if implemented now, with lower headcounts, that can pay off as demand increases? Can you do it with less energy, less electrical power, fewer resources and materials? For those in distribution, manufacturing and commercial operations, innovation may not be about inventing the next iPad, but learning to fulfill orders for it more efficiently. Productive and efficient organizations can survive downturns, even thrive in them. If you are trying to improve your operations, contact us. Even if you aren’t facing a particular problem, Cisco-Eagle specializes at helping companies understand their operations better, and finding ways to improve them.